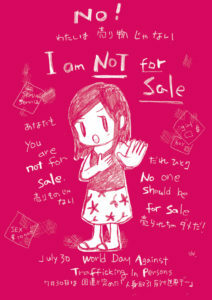 NOT FOR SALE JAPAN | We aim to abolish modern-day slavery and human trafficking. We aim to abolish modern-day slavery and human trafficking. “Human trafficking and modern-day slavery” …Doesn’t the phrase sound a little bit irrelevant to you? That they happened a long time ago or are happening in a faraway land? But in truth, THEY ARE very relevant to us. Let us explain the four reasons why it is so. In Japan, many people from Vietnam, China, Nepal, Myanmar (Burma), Indonesia, Philippines, etc., are working as technical internship trainees and students, in workplaces where Japanese people do not want to work for long hours and with little or no pay. Not only are they exploited, most of them are bonded with huge debt, unable to either change their jobs or go home, just bearing the situation. The employers, who know the situations of the workers, often treat them with abuse, violence, and sexual harassment, and do not give them medical care when the workers get injured at work. They confiscate their passports, lock them in, forbid them to possess cellphones, etc… in summary, causing various human rights violations to the workers. The foreigners whom you see today may be exploited just like the above. Among the trafficking victims identified in Japan today, half of them are Japanese; Japanese young women, particularly, college-age women, increasingly fall prey to trafficking. Are you familiar with the issue of forced participation in the pornographic videos (AV)? It is said that young women around 20 years old are targeted now. More accurately the phenomenon hidden for a long time is being revealed now as a result of NGO’s efforts and the women’s courage to speak up, rather than cases increasing. The characteristic of this particular kind of trafficking is tricking women by lies. Yes, it is fraud. Even if you think you are applying for a part-time job such as small modeling jobs (parts models, cut models, etc. ), or just going with a scout who greets you on the street and wants you to hear their explanation, you are literally already trapped. They will do whatever they can to make you sign the contract. Even if you feel that something is wrong, after long hours of persuasion or being threatened by several men surrounding you, it is in fact impossible to say “no”. They will use the photocopies of your student ID or medical insurance ID to threaten you. After signing the contract, it is almost impossible to decline the job offer of pornographic videos because they will demand millions of yen in penalties. They are very sophisticated…they are professionals. In adult videos, especially, once the scenes are videotaped, the data of the clip will remain for good on the internet. So, even if the sales are stopped by a court order, they remain forever on the internet or in someone’s computers, making the victims suffer for the rest of their lives. These are examples of human trafficking where people are deceived and exploited. This year, the Japanese government finally recognized the dehumanization of human trafficking and began to take measures against it, but many victims are still being silenced. Those who are working as slave laborers, in fact, are related to us because what they are working to harvest, dig, and catch on farms, mines, and fishing boats are, in turn, mostly sold as daily goods around the world including developed countries. For a well-known example, chocolate is made from cacao, 70% of which is produced in Ghana and the Ivory Coast in West Africa. In those two countries, there are many farms where young children are deprived of opportunities to go to school, scared by severe physical punishment and verbal abuse, forced to labor with almost no pay for long hours. The work on the farm is dangerous for children: climbing up tall trees, carrying heavy loads that weigh as much as 20 kg, and cracking cacao shells using big hatchet with bare hands. In Thailand, male migrant workers from surrounding countries are tricked onto fishing boats and are forced to work in slave-like conditions without being able to go home for years. The fishing boats on the sea have no way to escape, no outside observers, and the threat to be thrown in the water which is very effective, so workers have to endure whatever harsh conditions they face. The seafood products that are caught in these conditions are later manufactured as canned food or fed for cultured prawns, and eventually sold in Europe, US, and Japan. In Japan, many of the internship trainees who are exploited in slave-like conditions are working in the garment factories. Garment factories in Japan are under the pressure of low-price “fast fashion” abroad, so cannot pay much for workers. Your clothes or other textile products, even if they are made in Japan, cannot be guaranteed as “slave-free”. Now, you might understand that the whole story of human trafficking and slavery are all related to each of us. But then, is learning about it enough? You might just think “oh well, I will be careful not to be lured by scouts!” But is that it? The fourth reason why the issue is relevant to us is that each of us has keys to the solution. You may feel helpless to think that you can do nothing to stop the horrible things that are happening around the world. But as a matter of fact, we do have many ways to stop them. First of all, this is what anybody can do: tell others. There are many people out there who do not know that the problems of human trafficking and modern day slavery exist. Even if they do know it, many of them would dismiss it as it has nothing to do with them. So, please let other people know via SNS like Twitter, Facebook, LINE, Instagram, etc. NFSJ has a Facebook Page (https://www.facebook.com/notforsalejapan/), so please “like” the page, then, you can receive and share the news and event information. © 2017 Not For Sale Japan All Rights Reserved.